This is my first post on this forum. My name is Andrej Vrbec and I'm from Slovenia. I've attented launches in Drawsko-Pomorskie and Torun last year so I allready know quite a few members of this forum. A few weeks ago I have launched a rocket powered with a 84mm, 11kNs filament winded fiberglass case sugar motor. Flight was successfull, it flew to 8km and reached a max. velocity of 824m/s (about Mach 2.4). Max acceleration was 45G's and the rocket became supersonic 1.2 seconds after launch . Arecorder was also flown on this rocket and it recorded good data. Baro altitude/time graph is included in the video. Do you guys plan on any launches this year? Ostatnio zmieniony czwartek, 10 lip 2014, 09:43 przez Andrej, łącznie zmieniany 1 raz. It seems that Youtube links are not working. How can I fix this? Great rocket ! Can You tell me how do You make this fiberglass tubes ? OK, thanks a lot. Now I got it working. Thanks a lot ! And one more question, how big is the nozzle erosion ? It`s made from steel, right ? Yes, the nozzle is made from 42CrMnO4 stell alloy. Nozzle throat erodes by about 0,2mm in diameter. Andrej pisze: Arecorder was also flown on this rocket and it recorded good data. Baro altitude/time graph is included in the video. Hi Andrej, nice to see You here! And You started with a kick - what a flight Congratulations!! Unfortunatelly we are not allowed in the military areas this year so no high altitude flights are possible. We'll do our best to be allowed next year, and of course, if we succeed, You are most invited! 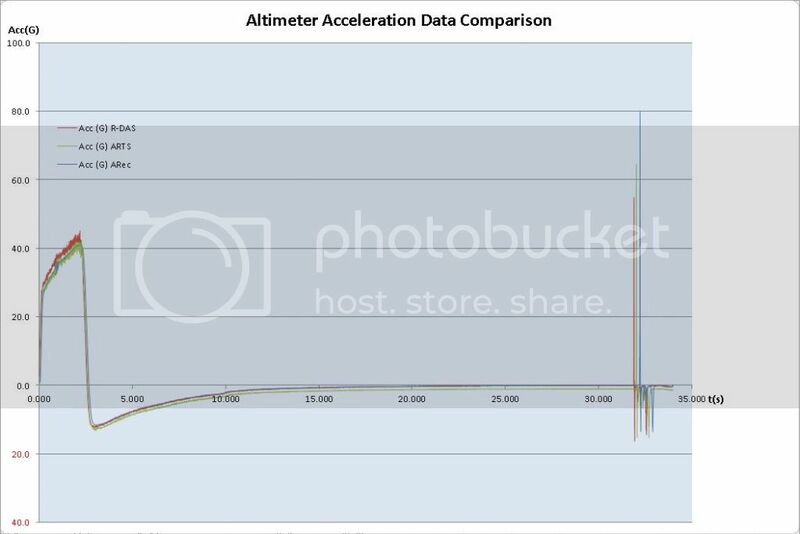 What about the readings from accelerometers, what are the results of the comparison? I want to present Andrej rocket engine thrust characteristic, which has been calculated based on ARecorder acc. data. This is very good solid rocket motor, characteristic and efficiency is perfect. I am really impressed. Two small distortions on the top of a curve is a sound barrier breaking. "Good performance of this motor comes mainly from a good start-up sequence and a high chamber pressure (about 90 bars). Quick start-up sequence is achieved with a well designed igniter (it takes about 200 miliseconds to reach a working pressure) and a geometry of the propellant grain. Also the propellant is processed so that the actual measured density of the propellant is about 97% of theoretical density. Nozzle itself was also designed for good performance." with a modest 12bit ADC and say +/-3G range, you can calibrate this smaller accelerometer precisely to 1G by inverting it on the table. This is not possible with similar precision using +/-80 G accelero, as the readings are typically too noisy. However, once you launch the rocket, the smaller one saturates at around 3 or 5G depending on what version you choose, at this point you can precisely recalibrate (pos-flight) the larger range accelerometer to the smaller one by averaging a smoothly rising acceleration curve between 1 and 3G. Then you can have best airspeed data and approx. altitude data from it. As I see on the plot the accelerometers from various manufacturers are off by as much as 1G. Altitude data comes from different sources: GPS (MSL or WGS84 altitude) barometric (unknown calibration and formula precision etc) so it is hard to compare. Knowing takeoff location one can establish relationship betweenprassure and those altitude for a given day. BTW you are acting as insurgents, in the middle of dark forest, somewhere in Europe... I like it. I regret I didn't gave you mine for testing (got 3D gyroscope and GPS also, but it is a large 5x12cm flat panel normally designed as an autopilot for airplanes and other secret things), maybe another time if you would be interested.